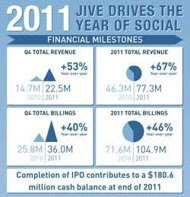 Jive Software (JIVE) continues to be one of the most interesting recent IPOs. Jive provides social business software and is the first publicly traded pure play. After the close yesterday, the company reported it's first quarterly report as a public company. Both revenue and earnings beat estimates. The company guided to numbers for Q1'12 and FY'12 that beat estimates. All great numbers compared to expectations. The only problem though is the company still expects a loss around $.40 in 2012 on revenue around $110M. So even though the company has one of the more interesting market opportunities to develop, the valuation for the stock is relatively high at nearly $1B. The revenue estimate for 2013 quickly jumps to $150M so any material drop in the stock price during 2012 would provide an appealing entry point. First Quarter 2012 Guidance: Total revenue is expected to be in the range of $23.5 million to $24.5 million. Non-GAAP loss from operations is expected to be in the range of $7.0 million to $7.5 million. Non-GAAP loss per share is expected to be in the range of $0.13 to $0.14 based on approximately 61.4 million weighted-average diluted shares outstanding. Full Year 2012 Guidance: Total revenue is expected to be in the range of $108.0 million to $112.0 million. Non-GAAP loss from operations is expected to be in the range of $23.0 million to $25.0 million. Non-GAAP loss per share is expected to be in the range of $0.40 to $0.45 based on approximately 61.7 million weighted-average diluted shares outstanding. Free cash flow is expected to be in the range of ($5.0) million to ($7.0) million. I think this software could have posed as a strong competition into the australian payroll software market, isn't it?